Home > Shop By Brand > Griot's Garage Car Care for the Perfectionist > Griots Garage BOSS G15 Long-Throw Orbital Polisher Free Bonus! 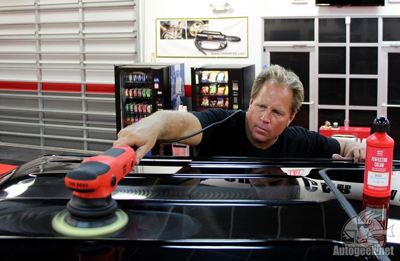 For a limited time only, receive a Griot's Garage Orbital Polisher Rack FREE with your purchase! The power to achieve perfection. Griot’s Garage BOSS G15 Long Throw Orbital Polisher is a high-powered dual action orbital polisher designed to make quick work of paint defect removal. The sleek body design and lightweight build of the BOSS G15 are perfect for extended buffing sessions as well as quick spot work. Designed with both professional detailers as well as weekend detailing enthusiasts in mind, the Griot’s Garage BOSS G15 Long Throw Orbital Polisher is the perfect addition to your detailing line-up. Powerful 900 watt, 7.5 amp motor, delivers the torque to maintain consistent pad rotation for advanced paint correction. Smart heat management engineered throughout enhances tool consistency and extends pad life. 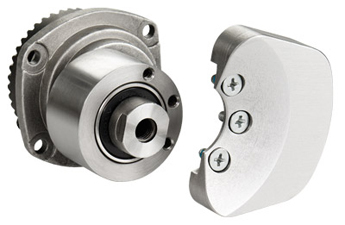 Variable speed trigger throttle allows the user to throttle the tool from a dead stop to the maximum dial setting incrementally throughout the sweep of the trigger. Quick response delivers the power when you want it, acutely focusing the control you have over the tool. The BOSS G15 Long Throw Orbital Polisher may use either a 5” or 6” Pad system interchangeably. The BOSS G15 Long Throw Orbital Polisher combines the safety and ease of use that Griot’s engineered into their first polishers with the latest advances in machine buffing technology. The 15mm throw of this machine makes removing swirls and defects in the paint a breeze. Traditional machine buffers and polisher have a relatively small throw (4-8 mm) and take more time to perfect the paint. 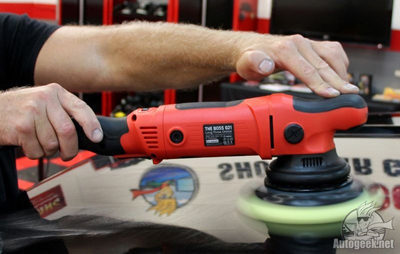 Griot’s Garage BOSS G15 Long Throw Orbital Polisher boasts a 900 watt motor which is sure to remove any of the paint defects you may be facing. 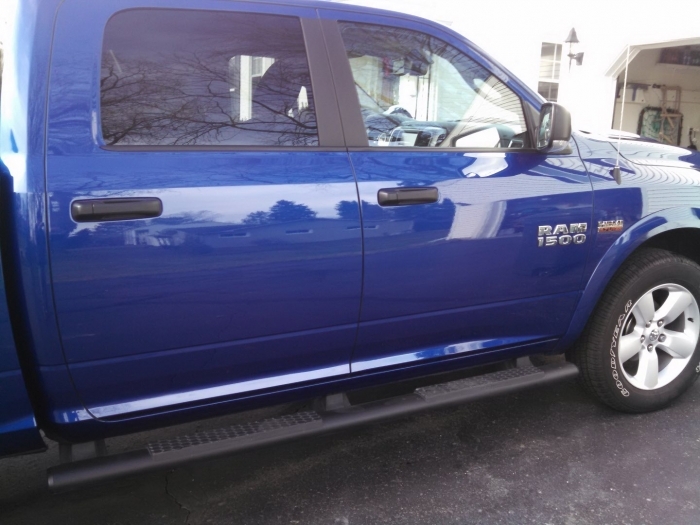 Considering how much work goes into making your paint shine, every second saved is valuable! Griot’s Garage BOSS G15 Long Throw Orbital also includes an anti-fatigue feature in the form of a Trigger Lock Button. This allows the power trigger to be held in place while polishing the paint. This is the perfect feature when polishing for an extended amount of time! And it doesn’t hurt that the Griot’s Garage BOSS G15 Long Throw Orbital Polisher only weighs in at about 5 pounds! The BOSS G15 Long Throw Orbital Polisher can be used with both the 5 inch Griot’s Garage BOSS System Hook & Loop Backing Plate (comes installed on the machine) and the 6 inch Griot’s Garage BOSS System Hook & Loop Backing Plate (can be purchased separately). 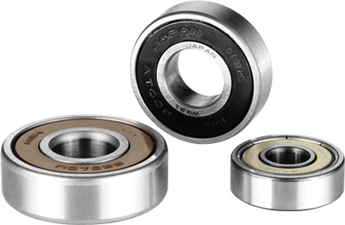 The backing plates designed for this system have been made with the latest technology. Made with “Smart Heat Management”, their horizontal and vertical ventings reduces heat build-up and optimizes pad, effectively extending the life of your pad. The Griot’s Garage BOSS G15 Backing Plate comes with a pre-lubricated shroud and backing plate. Griot’s was also generous enough to include replacement silicone lubricant if needed! Griot’s offers an optional washer modification for increased defect removal. The washer is included with the polisher. Griot’s has designed their new system to work together exclusively so it is recommended that only Griot’s Garage BOSS System Pads be used on this machine, with the correct sized backing plate. More optional features of the Griot’s Garage BOSS G15 polisher include a D-Handle with rubberized grips and a right-angle side handle. The BOSS G15 Long Throw Orbital Polisher is a variable speed machine, meaning that different speeds are used for different purposes. When performing paint correction, you want to use settings #4 and #5 and when applying waxes and sealants, you want to use settings #2 and #3. The Griot’s Garage Long Throw Orbital Polisher has the optimal performance power for both enthusiasts and detailing professionals alike. Griot's Garage Lifetime Guarantee - Griot's Garage will repair or replace any defective tool, without charge, due to faulty materials or workmanship for the working life of the tool, subject to exclusions. Two Year Comprehensive Warranty - With online warranty registration, Griot's Garage will facilitate replacement of worn parts caused by normal use, without charge, anytime during the two year from date of purchase. I got rid of my Rupes 21 mm big foot polisher to try out this one. The Rupes was amazing don't get me wrong, but I didn't like several things about it. First, the velcro on the backing plate hold the pads so unnecessarily tight that you end up mutilating pads half the time when trying to pry them off with a ton of effort. Also, I hated how it had that fancy "Ferrari" type of reputation which I believe to be why they charge so much for replacement parts & such (ex- a 5" backing plate I wanted to put on the polisher was $50.....where the Griot's is just $25). The Griot's just looked so promising, very similar design, more powerful motor, made by a top notch company. I went with the G15 because I have a mustang & tend to work on cars with more complex body lines, the G21 is definitely just as good but is more useful on larger vehicles or ones with flatter panels. This machine was everything I hoped for and more. Comes in fantastic, detailed packaging. Has a whole guide/chart in the box for beginners to simply things for beginners on what pad & polish combos to use when, comes with a warranty card (I need a new one, lost mine when opening the box, still can't find it....Don't do this, fill it out immediately and send it to Griot's). Even more impressive is how Autogeek includes awesome free gifts with the polishers, such a great value! I received the entire boss line of polishes & compounds with my polisher, not even just small sample bottles, full sized 16 oz bottles! ($80 value) I have also seen Autogeek offer a Griot's creeper seat with the polisher and currently they're offering a Griot's polisher rack with the polisher (also $80 values). Regarding performance, more powerful than the Rupes, super smooth motor, doesn't stall super easily on corners, super low vibration, super quiet. The G15 also has a super comfortable ergonomic platypus head to hold on to, beautiful red body, positive click feedback on the speed dial which the Rupes lacked, rubberized grips in the perfect spots where the Rupes did not have (these also offset the red color which looks very nice) and just has such a more well built, solid feel too it than the Rupes. The Rupes feels more fragile. Not to mention, the Griot's is about $55 cheaper than the Rupes. the boss g15 is a well balanced powerful machine, i first used it as shipped and found that pad rotation was dragging a bit, as in slow or restricted rotation, it was designed that way, however they include two washers you can install between pad and drive assembly. The pad rotation is now full free spinning and works as i would expect it to. This small modification makes the g15 very powerful. Comparing this model against other polishers it is actually close to the flex in power as it does not stall out very easily, in the hands of an experienced detailer, its correction ability is very good. I am using 5 1/2 inch pads with the g15 and very satisfied with the results. The g15 is a good addition to your arsenal of polishing machines. After a year or more, I was surprised to see there was only one review of the BOSS G15 here at Autogeek, so I thought I would write mine. I'll start by saying this machine is incredibly smooth (vibration-free) making it a real pleasure to use. Prior to owning the G15, I used a PC7424XP and Griot's 6" DA. The 7424 being a step up from hand polishing, and the GG6 a step up from the 7424. But in terms of correcting ability, the 15mm orbit of the G15 is very noticeable over the 7424XP and GG6. They are both good machines, and I still use them often, but the G15 corrects much faster and much better (key word). You simply have to use it once to see for yourself. The machine is also extremely well balanced and the front "platypus" hand grip just feels "right". Using the BOSS G15 trying makes polishing/correction/finishing that much more enjoyable. The longer orbit stroke allows you to get more correcting ability from the same polish vs. a smaller stroke machine. Using Griot's Finishing Sealant as a test (the least aggressive BOSS crÃ¨me) I was able to get better correction on the G15 than the same pad/crÃ¨me combo on a smaller orbit machine, and in less time. Perhaps said another way, it amplifies the pad/crÃ¨mes to their fullest potential. Cons- A little louder than I expected it would be. 3db - 6db quieter would make it a dream machine. I have had it for around a month now and could not be happier with it. I have only used a PC so i cant compare it to the other machines. It is comfortable to use and operates very smooth. I am just a weekend guy so i have only used on my family cars and a co workers. I have a bad elbow and after a few hours of the PC it would really hurt,not so with the Griot. It took far less time and effort to get great results with the G15. I cant wait to use it again. Proslots of power and not a lot of vibration. Comfortable to operate.